In order to respond to the multimedia era, KBS exapnded free services on its most well known app my K. Smart media services provided in tandem with TV programs were also expanded to heighten the competitiveness of new media services. KBS’ main mobile app, my K, has been expanded to allow users to view 30 different channels including KBS TV1 and TV2 as well as to view contents again. The my K app also provides the flagship 9 o’clock evening news of each local station and all local programs free of charge. Virtual Reality has been changing both the production and consumption of media content. VR offers new opportunities news and content production as it allows active audience engagement with the content itself. 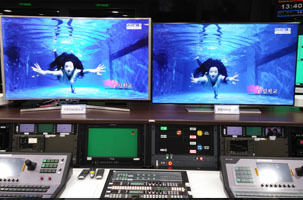 During the Gwangju Universiade my K aired real-time terrestrial programs, self-produced KBS programs, and games specifically for the my K platform 24 hours a day. my K realized live national sporting events broadcast through smart media.